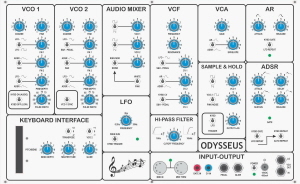 A clone of the ARP Odyssey designed to fit in to a 6U 84HP rack system. The Odysseus tries to remain true to the original design by using, where practical, original components. The keyboard section has not been included (internal connections available if required) and has been replaced by our MonoDAC MIDI-CV converter for control by any suitable MIDI Controller.